The Thunder erased a 26-point deficit to defeat the Rockets tonight in Houston by a final score of 117-112. This marks the largest comeback win by the franchise since moving to Oklahoma City. Paul George led all scorers with 45 points (12-22 FG, 6-14 3pt FG), 11 rebounds and 3 assists for the Thunder, while Russell Westbrook secured his 22nd triple-double of the season (9th consecutive, tying Wilt Chamberlain for the longest such streak in NBA history) and 126th of his career with 21 points, 12 rebounds and 11 assists. James Harden totaled 42 points for Rockets, continuing his streak of consecutive 30+ point games to 29 (behind Wilt Chamberlain’s 2 streaks of 31 games and 65 games). With the win, the Thunder improve to 36-19, while the Rockets fall to 32-23 on the season. 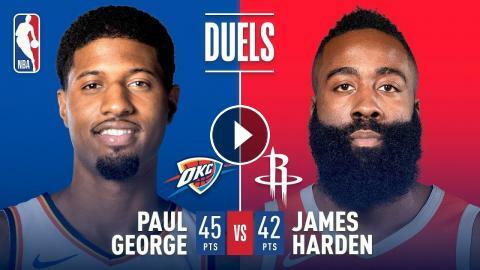 NBA Duels showcase ONLY THE BEST head-to-head matchups from the around the Association, past or present.